With the extreme heat this summer, ice cream has become a necessity. It’s perfect for those sweaty, so-hot-you-don’t-even-want-to-eat days. It’s sweet and smooth, but most importantly, very, very cold. While it’s easy to buy delicious ice cream, it’s far more fun to make your own. Not only do you get to create your own flavor combinations, but you can avoid all the artificial additives that go into the commercial version. Your frozen treat might not be healthy, but at least it’s a little less bad for you. Like risotto or homemade caramel, making ice cream sounds far more intimidating than it really is. You do need an ice cream maker, but you can easily purchase one for around fifty dollars that will last for years. Trust me, it’s a worthwhile investment. The other important factor is time. For good ice cream, you need to make sure that your custard properly chills and that the final product has time to harden in the freezer. I generally make and churn my custard at night, then place it in the freezer overnight to harden. You get to sleep while your ice cream cools down and you can even sneak a bite at breakfast. My favorite method for making ice cream comes from Jeni’s Splendid Ice Creams at Home, a brilliant new cookbook. Unlike a lot of chefs, Jeni does not use eggs, which makes for a lighter and less labor-intensive ice cream. There’s also a lot less room for error, so you don’t have to worry about accidentally making scrambled eggs instead of custard. Her recipe uses cream cheese and cornstarch to thicken the mixture. The cream cheese also adds a nice tang so that your dessert is never cloyingly sweet. 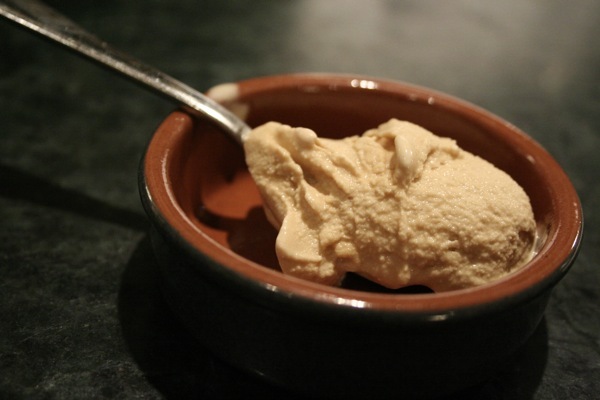 I’ve included her recipe for salty caramel ice cream, which is one of her star flavors. It’s perfect for ice cream sandwiches or with some fresh peaches. Feel free to adapt the recipe, mixing in brownie chunks, nuts, or chocolate chips. Whatever you do, it’s bound to be better than anything from a carton. Hillary Pollak is a senior at New York University, where she studies sustainable food. She loves almost anything involving fruit. Whisk the cream cheese and salt in a medium bowl until smooth. Mix the cream with the corn syrup in a measuring cup with a spout.